I love universities. I went to kindergarten at a university. When I started school I spent many afternoons at a university since there wasn’t always someone at home to look after us after school so my sister and I went to the university where my father worked – and still does – instead. We would draw pictures on the blackboard of one of the seminar rooms. Occasionally we’d come back the next day to find our drawings still there and new ones added by some unknown soul, presumably a student. Then when I finished school I studied at a university and after that, I even worked in one for a little while. Universities have a nice vibe and I have always enjoyed visiting them which now happens fairly regularly since I’m married to an academic. 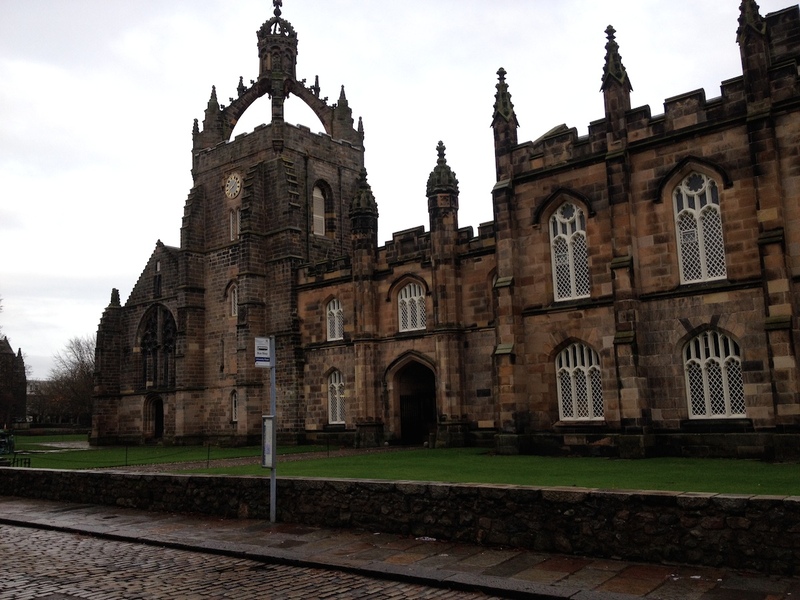 Today we visited the University of Aberdeen which is quite lovely. It’s the third oldest university in Scotland, behind the University of St Andrews and Glasgow University, and the fifth oldest university in the English-speaking world. 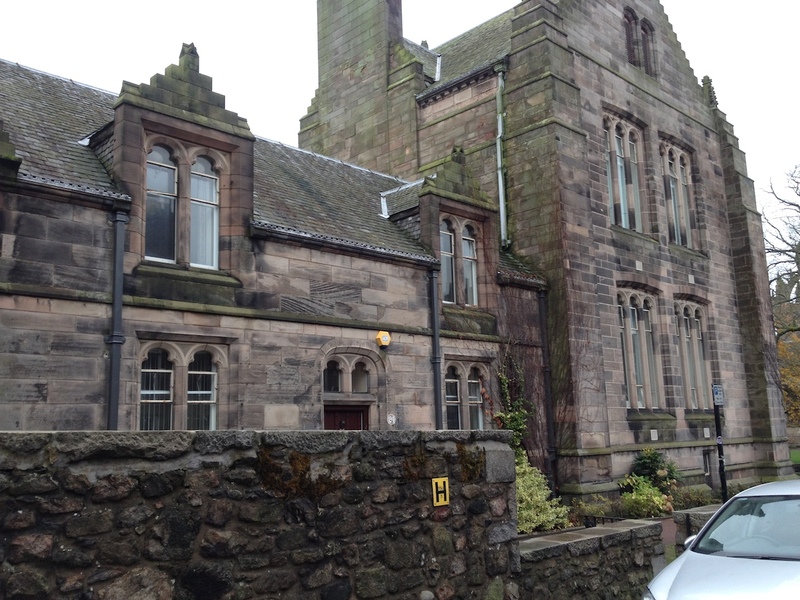 It was founded in 1495 by William Elphinstone, Bishop of Aberdeen and Chancellor of Scotland. This photo is looking south down High St which runs right through the middle of the campus. Also on High St are the Powis Gate Towers. We took Busby of course. I never photoshop my photos. I don’t have Photoshop and even if I did, I wouldn’t know how to use it. All I ever do is resize my images so they’re not so large and once recently I increased the brightness of a photo because it was a little dark. But other than that, I never edit the photos. There’s something very weird going on with the back wheel in this next photo. I haven’t touched the photo at all other than resizing it so I’ve no idea what happened. Not all the buildings are old. Here’s a very modern one and it’s quite striking and pleasing to look at. 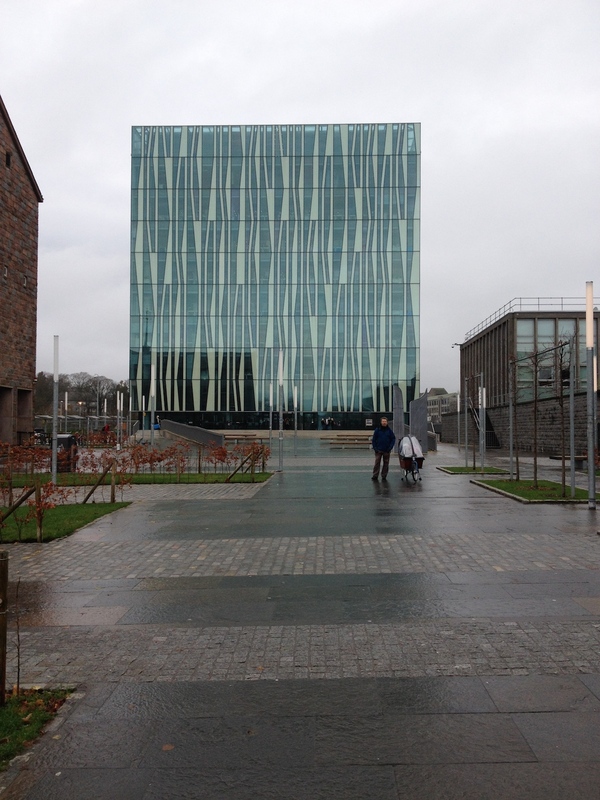 It’s a library – The Sir Duncan Rice Library – and was designed by a Danish firm, Schmidt Hammer Lassen architects. I’ve heard that the same firm are involved with the design of a new library in central Christchurch to replace the one that was destroyed by an earthquake in February 2011. For some reason mathematics departments are always stuck in ugly buildings from the 60s and 70s. 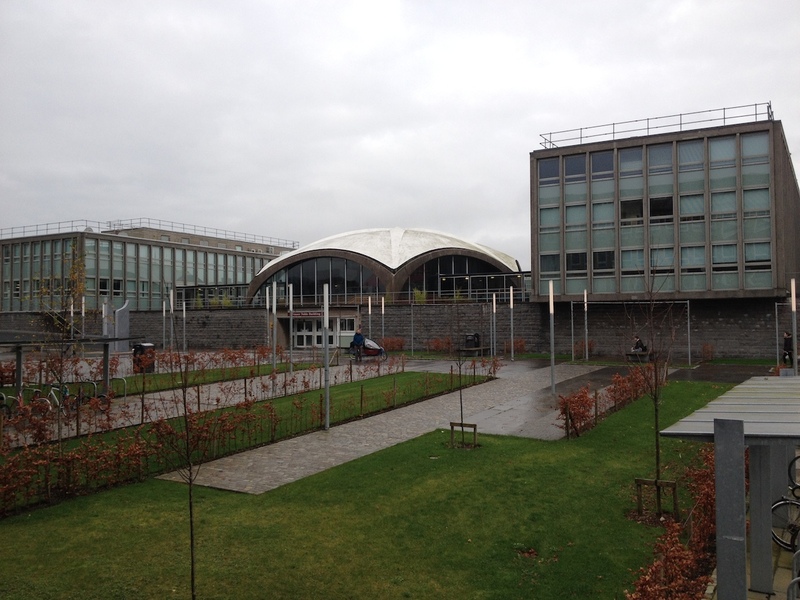 Mathematics at Aberdeen University is no different except that the building is actually rather nice. It’s the dome structure in the middle of this next photo and although it’s distinctly 1960s-looking, I think it’s quite attractive. It must be the only 1960s University mathematics building in existence that looks attractive. 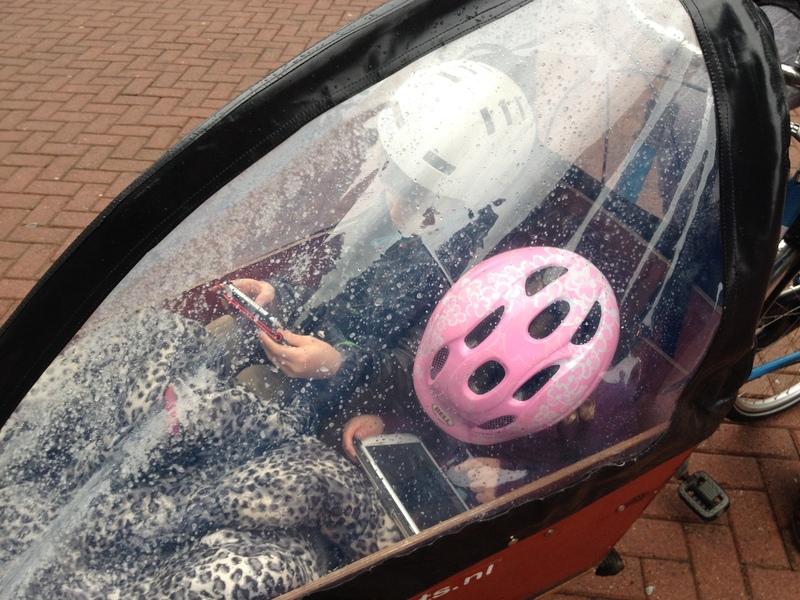 Here’s a close-up of the kids in the bike playing with gadgets. I’ve been cycling mostly on the footpaths. 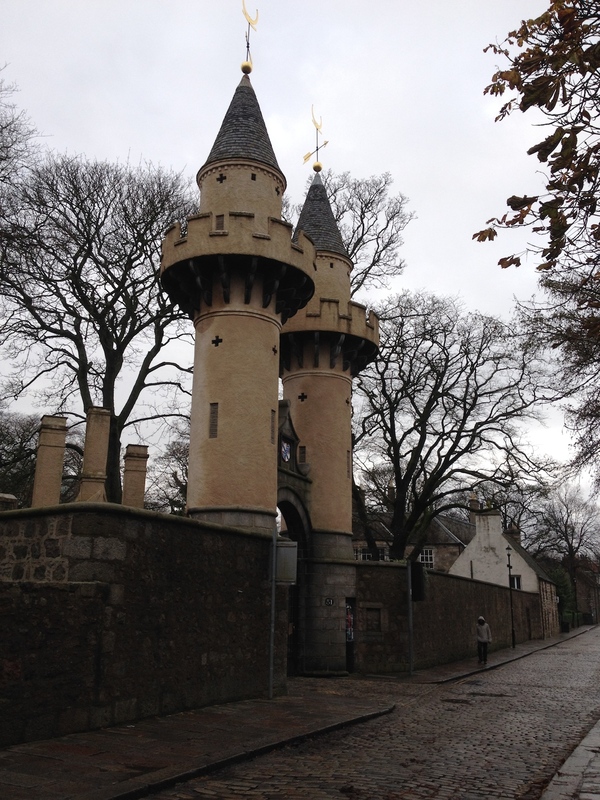 There isn’t really anywhere else to cycle in most parts of Aberdeen. No-one has abused me or seemed upset with me for doing this but perhaps it’s only a matter of time. 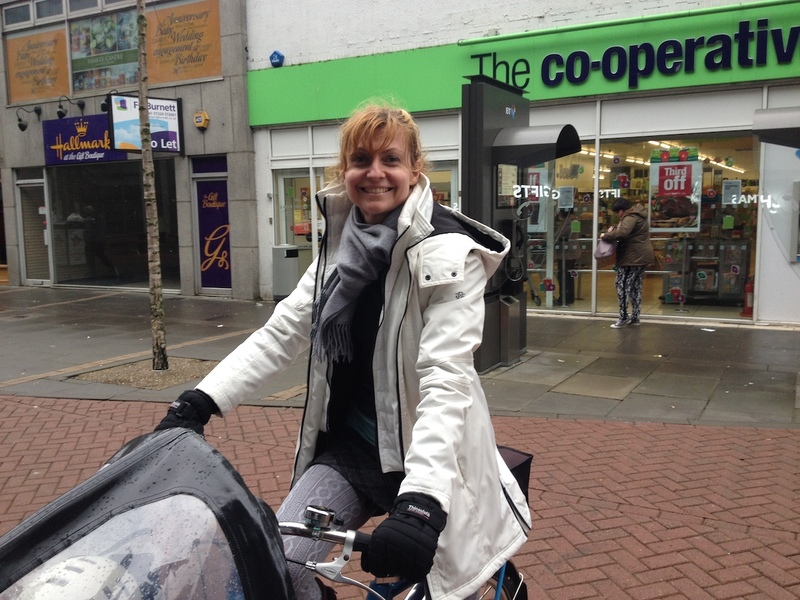 I have been abused once before for cycling on the footpath in Christchurch, New Zealand many years ago. 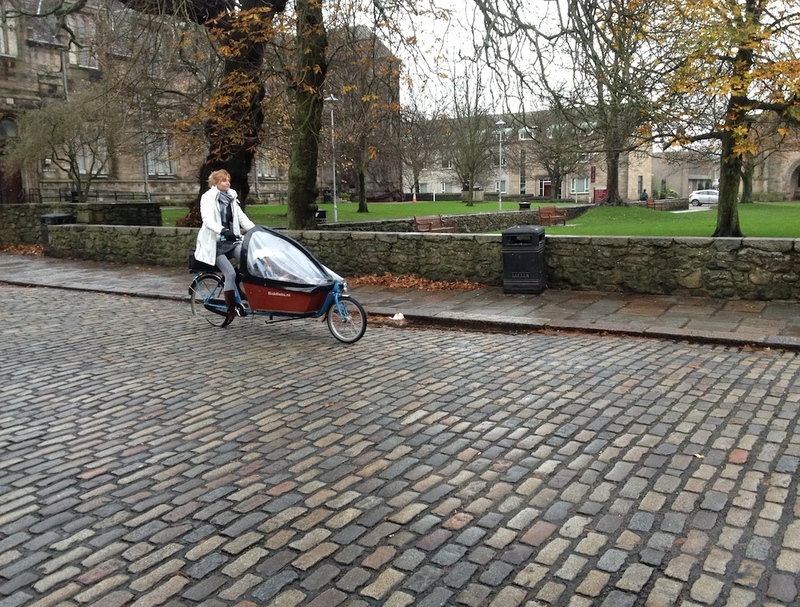 Twice now in Aberdeen I’ve cycled passed police officers on the footpath and on both occasions they smiled at me. So far so good. 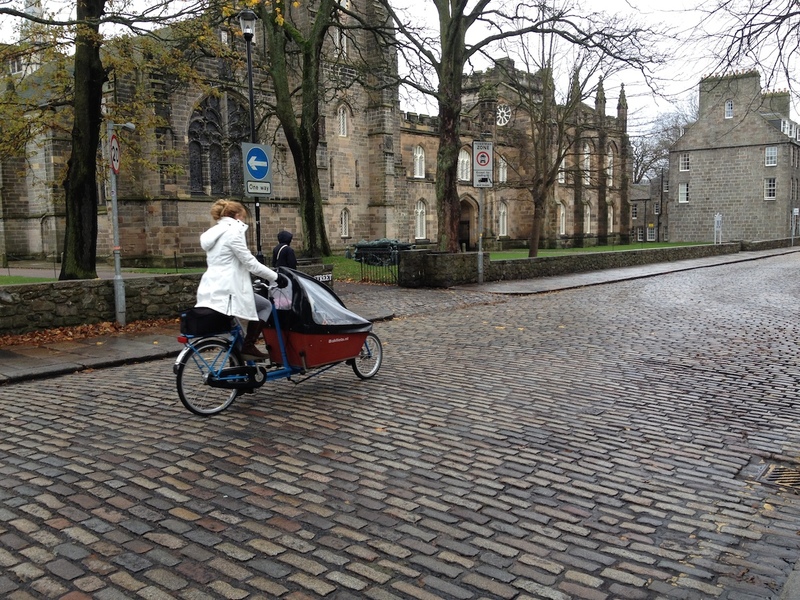 Posted in Aberdeen, Cycling and tagged Aberdeen, architecture, bakfiets, cycling, University, University of Aberdeen. Bookmark the permalink. Yes the maths building is always in a 60s block! When I was at Uni also Computing and Engineering were housed next door to maths in a 60s high rise. 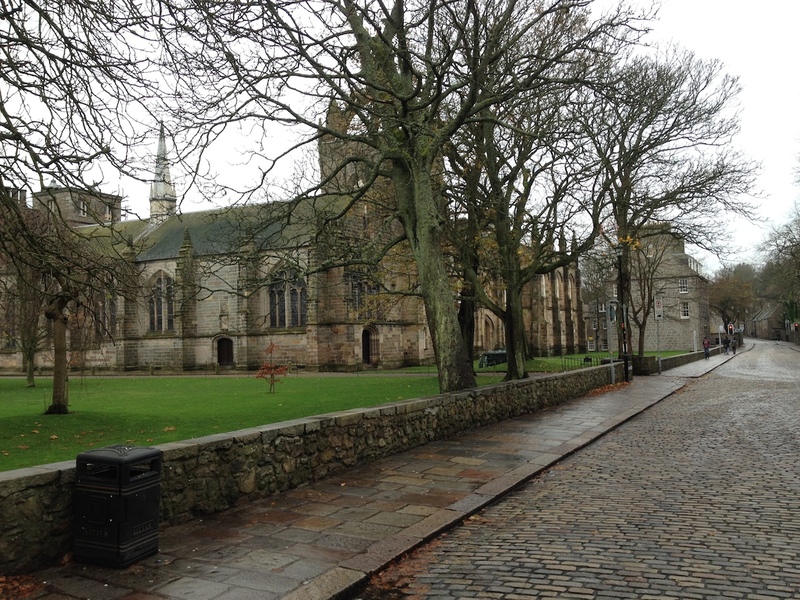 Aberdeen is a nice looking University. I think it’s because in the 1960s and 1970s mathematics (and also science in general) had quite a high profile and was a growing field and so new buildings were built to house these departments. Now the buildings are old and unfortunately were built at a time of disappointing architecture. Thanks! I almost didn’t notice the wheel. It was only when I was proof-reading the post that I saw it. Fantastic pictures. It seems like such a great place for a bike ride, or even a stroll. Thanks so much. A cheery smile & greeting works wonders? Maybe. I did look at both police officers in an effort to make sure I wasn’t purposefully avoiding eye contact. I’m pretty sure they smiled first though. I see you’ve been to Dunnottar castle, was it nice? Also our police aren’t an occupying force, unlike many in the USA, so they actually smile and are nice to people, rather than shooting them first and asking questions later. 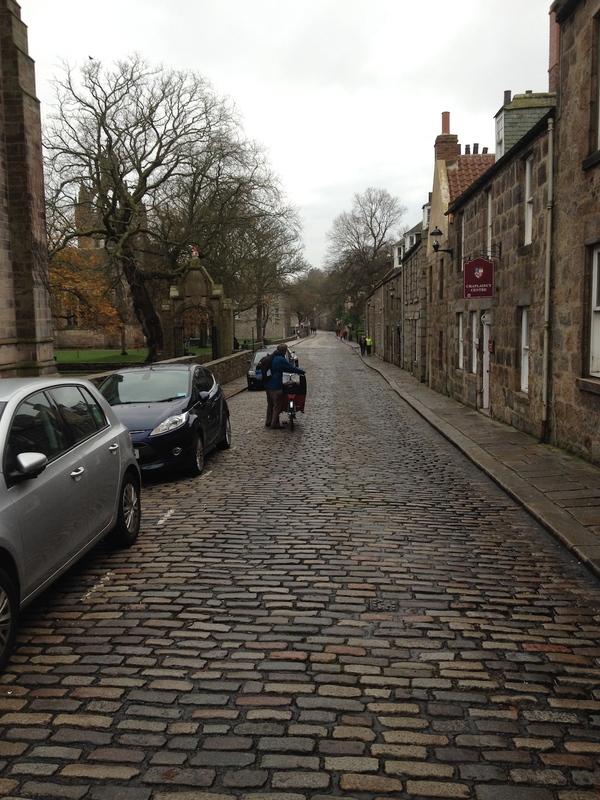 The shame in Aberdeen is that the council 30 or 40 years ago, when it was all the rage, destroyed a number of medieval streets and old houses. Dunnottar Castle was fabulous. We were there last weekend and will definitely go back at some stage. Ah, I didn’t know about the destruction of medieval homes and streets. That’s a terrible loss. Oh how I wish I could have seen them. I love old universities. They seem to retain the essence and endeavours of everybody who has passed through there halls. Me too. There’s something so nice about old universities. The buildings were built to last back then and so they have been around for such a long time and seen so much. I think they’re probably also a source of inspiration. Beautiful architecture is uplifting. I’ve never seen that happen on my phone before. Very weird. I love your photos and they don’t need any photoshop. Busby effect is surreal, though! Thanks for introducing this university to us. Very beautiful. Yes, there’s something to be said for a beautiful building to motivate and inspire. I’m glad you liked the photos. 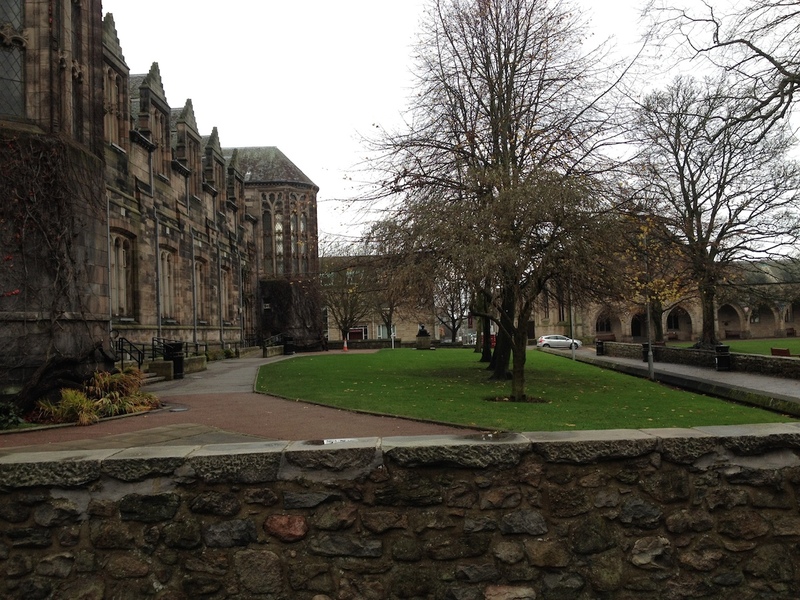 Aberdeen uni is beautiful. The library is a stunner. Thanks for posting all the gorgeous photos. By the way, how strange is that with your bike tyre. I enjoyed the photographs. Thanks! Good! I’m glad to hear it. Thanks for stopping by. I couldn’t see any students there, why ? You went there on public holiday or school holiday ? We went on a Sunday and it was very quiet. There were quite a few students in the library but not very many wandering around.